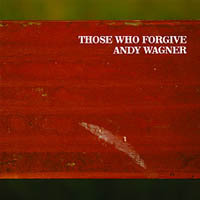 Andy Wagner’s third album, “Those Who Forgive”, is a melodic rock six-song EP from Rock Proper, a net label devoted to distributing quality rock albums covered under the Creative Commons license. “Those Who Forgive” is indeed a “quality rock album” – it’s a bit on the slower, more melodic side with a touch of blues and maybe even country here and there. Andy’s deep melancholic voice and his down to earth lyrics will make you stop, relax and contemplate their meaning. After his second album “Departures” was released in 2006 (Tense Forms), Wagner spent a year producing and performing with New Orleans mainstay, Theresa Andersson. In the summer of 2007 he returned to Chicago and began writing songs for this release. Unlike previous releases, on “Those Who Forgive” Wagner organized a trio to perform on most of the songs, whose energy contrasts the quiet piano arrangements on the others. The album was recorded over an eight day stretch at Jay Bennett’s Pieholden Suite Sound in downstate Illinois. The sessions took place in September 2008 and were engineered by Matt DeWine. About half of the tracks were cut live with Ben Clarke (Lying In States) on bass and Matt Martin on drums. The overdubs and additional tracking were covered by Wagner. During his seemingly endless travel between New Orleans, Louisville and Chicago, Wagner felt the pull of the future and struggled to reconcile this with the people and places of his past. It was on these long highway trips when he realized that no worthwhile dream arrives without significant challenge and loss. Reeling from a painful stint with a major label band, this realization helped him find peace in the chaos and focus on moving forward. Along with the faces of the strangers on highway, his work is inspired by the Americana legacy of Wilco, Calexico and Gram Parsons. This album will be available for free download on RockProper.com, February 23rd, 2009. Rock Proper is an online music distributor built to take the place of traditional record labels and deliver music made with integrity directly to listeners around the world. This record will not be issued in compact disc format but may be available on vinyl in the future pending interest.